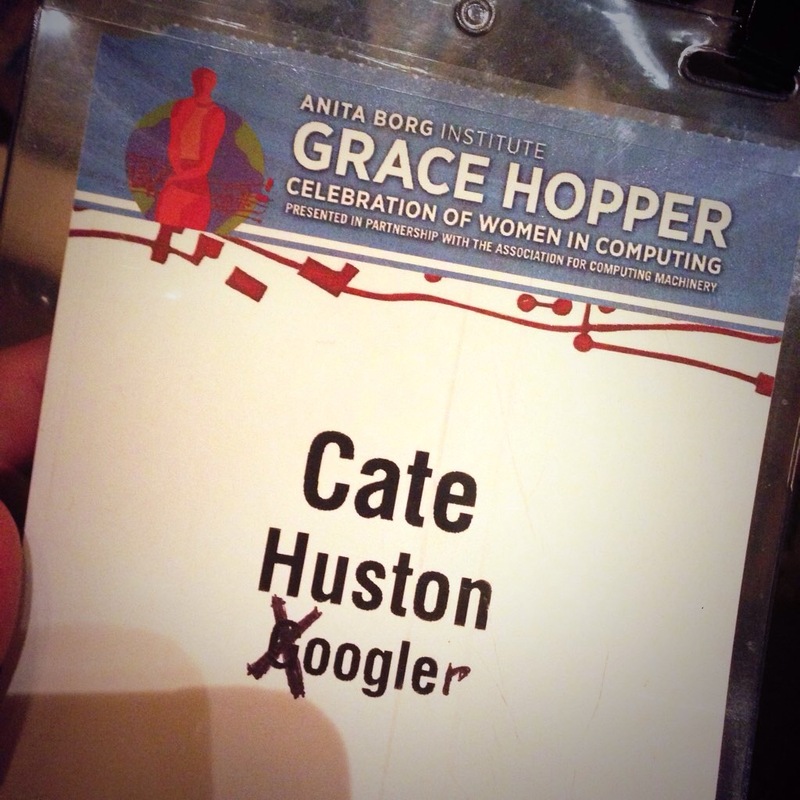 I’m heading to Houston, Texas this week to go to the Grace Hopper Celebration of Women in Computing. It’ll be my sixth time attending, and over the years I’ve gone in various guises. As a grad student, a Google employee, in disguise (I de-branded myself and refused to do any recruiting activities), as an independent. This year I’ll be there as a blogger. Luckily he had stamped my passport by then so I didn’t need to come up with a good answer. I made it to my plane, put my shoes back on, and went and had a great time. Met lots of amazing people, accidentally interviewed for a job in California. The usual. One year I danced with my friend Sri and Maria Klawe. I met engineers from Australia who became my friends when I moved there. My friend Sabrina was on Women of Silicon Valley recently, so now more people know how awesome she is. But I knew already, because we met at GHC. I met Anne-Marie (amongst other things, founder of Stemettes) as I was giving out tshirts at the party. When I moved to London we got to hang out, properly, and I became a “Godmother Stemette”. Last year was disappointing because men were front and centre. For four years I’d gotten my dose of women-inspiration there. I’m not sold on Lean In as a philosphy, but seeing Sheryl Sandberg give that talk live… that was pretty awesome. Nora Denzel was probably one of my favourites though. She gave a piece of advice about not expressing all your doubts when you get good feedback that I try to keep in mind, still. This year my friend Hilary is keynoting and I know it’s going to be awesome! One of the men from the panel is back to give a plenary, and well that seems weird. There were some issues with registration forms and trans people. And some women have been coming out to say they won’t be there, and why. Randi wrote about not speaking for free – and I don’t speak if my travel and accommodation costs aren’t covered either, I also think this is an inclusion issue. Academic conferences run on a different model, pay to play, which I kinda get but… well I just choose not to play. Most importantly, Erica wrote about “Colorless Diversity”, about not feeling included as a black woman because where are all the black women? I understand starting with women, we are fully 50% of the population, but if you end there you’re doing it wrong. Since reading Whistling Vivaldi (Amazon), I have also tried to push that rock up that hill at times, make this event open, include this other group, use the women-only event as a test, not the end goal. I’ve watched things that I started get less inclusive because I left and the people who took over had different motivations. We ran one event on interview prep that I wanted to open up to PoC, and low-income, and instead… it became women from one specific university. At that point… what are we even doing? It’s not “inclusion” it’s “diversity” and what they actually mean by “diversity” is “recruiting”. This is the kind of thing that drove me to quit corporate feminism. I’ve been getting pickier and pickier about women-based communities that I’m part of. Because I don’t want us to just recreate the same broken power structures. Because I don’t want to see racist language. Because trans or cis, my girlfriends are my girlfriends. Because if other women want to slam other women for not being nice enough to the patriarchy I don’t need to see it. But privilege is saying “I see the problems here but I’m going anyway”, because whilst I’ve trained myself to notice I don’t feel it. I care because some of my friends don’t feel welcome at this event where they should be welcome. I’m sad that we won’t get to hang out. I care because I don’t believe 50:50 is the goal. If we get to 50% and it’s mostly white women, we’ve just exchanged one kind of brokenness for a different kind of brokenness. Inclusion is work, and a women’s community is not automatically inclusive. All this work to include men… what if we worked even half as hard to include trans-women and women of color? Slightly disagree. Just a phrasing disagreement though, not on the key point. I’d say that it is solving one kind of brokenness while entrenching a different kind of brokenness. The lack of racial diversity, among others, is a problem. While whittling down the list of diversity issues by one is a good thing, your point of making every group inclusive is important. I really think we are not going to solve women in tech within the industry we have to today. I think female investing, buying, management power is the route. There should be women founded tech funds with a mission to develop talent, young kids & products. This could be like the fair trade movement. It would drive a new approach to working in the industry. The Bay area doesnt have to be the centre of the universe it would be diffuse in dozens of cities, more virtual, product, quality based not so IPO, cash out ROI (its Female Investment) Start ups etc. they can make their own rules on exit strategy.